GRAND JUNCTION, Colo. — One day when John Sherry was 10 years old, his parents picked him up from school and drove to a Ford dealership. They walked into a large showroom with Mustangs parked out front. He watched his parents, neither of them college graduates, ink the paperwork to buy a new, dark-green Taurus. Greg and Beth Sherry let their son sign his name at the bottom of one of the pages, just for fun. This isn't the lifestyle that John's parents wished upon their younger child. But it reflects the state of upward — or downward — mobility in the American economy today. Americans love to believe that anyone can get ahead, that they can build a better life than their parents had, simply by working hard enough. The evidence suggests, however, that this is less and less the case. Just working hard will no longer suffice, especially for Americans who haven't been born with wealth or particular talents. More and more, education has become the key to moving up — from poverty into the middle class, from the middle class into affluence — or to holding onto the middle-class lifestyle in which one was raised. There is also growing — though still nascent — evidence that from one American generation to the next, mobility is declining. It's getting harder, that is, to work your way into a higher income level than the one into which you were born. 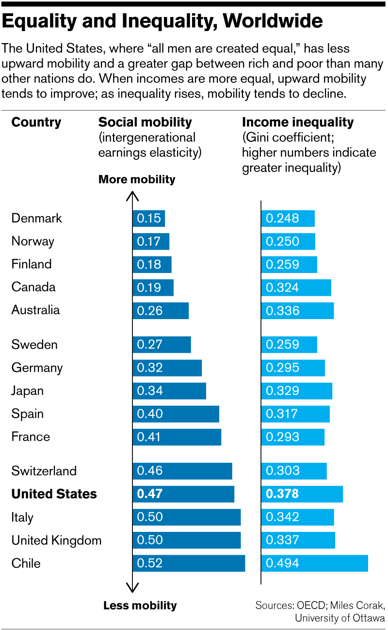 A son's adult income in the United States is about half dictated by how much his father made, a percentage that is nearly as high as in any country in wealth-by-birthright Europe, according to the Organization of Economic Cooperation and Development. In Europe, family connections and the circumstances of one's birth are considered crucial determinants of success, a consequence of the entrenched aristocracies in the United Kingdom and, to a lesser extent, Italy and France. This is far from the up-by-the-bootstraps, Horatio Algeresque self-image that most Americans hold dear. In the United States, immobility is a way of life, especially for the very rich and the very poor. Brookings Institution economist Isabel Sawhill estimates that 40 percent of children born into the topmost or bottom income quintile won't budge as adults from where they began. Katharine Bradbury, a senior economist at the Federal Reserve Bank of Boston, agrees. "Most of the long-term poor are stuck at the bottom; most of the long-term rich have a strong grip on the top; and each of these two groups is somewhat more entrenched than the corresponding groups 20 years earlier," she concluded in a research paper last spring. According to fresh research from the Pew Economic Mobility Project, middle-quintile children without college diplomas are more than half again as likely as adults to slide into the lowest 40 percent of income earners than are middle-class children who earned a college degree. They're also twice as likely to fall backward in wealth. College graduates are four times as likely to rocket from poverty into the highest quintile of wealth. "Having a postsecondary education is incredibly important for mobility," said Diana Elliot, research manager at Pew's mobility project, and it has "become increasingly important" from one generation to the next. For American children who aspire to the middle class, this reality highlights the road they need to take. But it can also be cruel, because poor children find it much harder today to finish college than wealthier ones do. "Children from rich families have much greater access to higher education than children from low-income families, even when controlling for innate skills," Economic Policy Institute researchers concluded in a recent report. "This educational barrier places profound limits on income mobility. " And in the tattered recovery from the Great Recession, wages even for college graduates have stagnated. Meritocracy is not only a solution to restoring upward mobility but also a way to fortify the bastions of privilege. Only twice in U.S. history — in the heyday of the Western frontier and in the post-World War II prosperity — have Americans found it easy to rise. This isn't one of those times. Middle-skill jobs (read: no college required) are disappearing from America's sputtering economic engine — in factories, in back offices, even lately in state and local governments. For generations, these jobs were the ticket to a comfortable life for Americans who went directly from high school to work. But increasingly in recent decades, economic research shows, lower-wage workers in foreign lands have taken these jobs or automation has rendered them unnecessary. Today, job growth occurs mainly at the poles of the skills spectrum — in sweeping floors or flipping burgers, which can't be outsourced, or in sophisticated engineering jobs that drive new industries. The world Greg graduated into didn't require an advanced degree. He could earn nearly $20 an hour in today's dollars — a wage that could support a family — by working construction or in a warehouse. Across the country, high school graduates could claim their diplomas and walk straight into secure, well-paying, benefit-laden, pension-bearing jobs on assembly lines or, in Colorado, harvesting trees or rare earth metals. Foreign competition was a speck on the horizon; outsourcing wasn't yet a dirty word. Comfort was their reward. Greg and Beth bought a house on the edge of town and a succession of new cars. Today, in the evenings, in the home where they raised their children, the couple can relax on a new living room couch, dine with a microbrew or a local red wine, and cover fresh peaches with ice cream for dessert. In his youth, John recalls summertime trips to a faraway beach — San Diego, South Padre Island, or someplace else — to splash with cousins in the surf. The parents knew early that their path might not be available to their kids. On a winter afternoon in 1983, Beth and Greg sat at tables in a high school cafeteria and listened to a senator from Colorado test out a presidential-campaign message about the changing global economy. This generation, Gary Hart told the crowd, is the last one in which people will hold a single job for 30 years; your children will need education and training to prepare for the tumultuous job market to come. The message stuck. When the Sherry children reached school age, their parents began saving for college. We'll pay for college, they told Allison and John — and we expect you to go. Today, the back door of John's West Denver house — purchased by his father and rented to John at a discount — opens to a sun-baked lot with litter and weeds, a fading pink shed, a drooping clothesline, and a back fence that looks one summer storm away from collapse. Inside, the hallways are cluttered with bikes, televisions, and secondhand furniture. John lives with two roommates who help make the rent. His mother calls the neighborhood "a barrio. " This is the house John landed in, years after he dropped out of Metro State. But when it came to school, John couldn't bring himself to care. It was hard growing up in the shadow of his older sister, now 34, who at age 10 started to walk around holding a clipboard and collecting quotes from her parents for miniature news stories. Allison, the first in her father's family to attend college, graduated from Colorado State University — her parents paid, as promised — and landed a job as a reporter for The Denver Post. John's elementary school teachers asked Beth and Greg why their son couldn't be more like Allison; whenever his parents conveyed this to John, he'd feel the sting and rebel. In high school, he skipped classes and spent a lot of time grounded. "I just didn't have the motivation," John explains. He graduated with a C- average. He attended Metro State because he wanted to leave Grand Junction; his friends were going to college, and his parents expected him to go. "It wasn't something I really wanted to do," John says. " "˜Obligation' would be a better word for it. " He hoped to earn a degree and go into social work. But the dream faded when he struggled with math and science. When he quit school, he was too scared to tell his parents. Only months later, after a relative saw him in a UPS uniform for a holiday temp job, did they learn that he had dropped out. Thanks to the wrenching changes in the American economy, John's career choices were few and unpromising. The assembly-line and clerical jobs that had sustained high school graduates were pretty much gone. Frank Levy, an economics professor emeritus at MIT, has written extensively on the changing skills the American workforce requires. These lost "rules-based jobs," as he calls them, are anything simple or routine enough for a computer or offshore worker to perform instead; they paid a lot more than the options that John had available after he left college. By Levy's calculations, a 40-year-old man with a high school diploma earns 5 percent less today, in real terms, than he did in 1980, while a college graduate who's 40 earns 25 percent more than before. The jobs available to high school graduates today also offer less prospect for rising pay. Levy's research suggests that a male high school grad in 1980 could expect his income to grow by about 75 percent before peaking in his mid-40s, versus just 61 percent today. John Sherry's work life has proved a long and punishing lesson in these unpleasant truths. He has never earned more than $13 an hour. Now he makes $11 an hour — about $23,000 a year — teaching students in an expensive preschool in downtown Denver. He sometimes relies on a sort of payday loan from his bank to pay his rent. He rides his bike and plays kickball in a league for recreation — they're both free — and brews his own beer at home. He wants to go back to school to study early-childhood education and become an elementary school teacher, with a salary at least double what he makes now. Meanwhile, he's thinking of applying for a job at night, waiting tables, or slinging drafts at a bar he frequents once or twice a week. Here's some good news: Today's households with prime-aged workers are bringing home more income than their parents did. Even after adjusting for rising prices over time, according to Pew, nearly 90 percent of middle-class children earn more, as a household, than their parents did at the same age. They're "ahead" of the previous generation — but with two painful caveats. The first is that, compared to people at the top, most workers are slipping behind. Income gains for the highest quintile of earners have run about 50 percent higher than for the bottom quintile. Think of it as a marathon: Everyone is farther along the course, but the rich have widened their lead. Looking beyond income to consider a household's wealth — including savings and assets such as investments and a home — the middle class and poor are actually moving backwards. For households in the top two quintiles of income, inflation-adjusted wealth has grown by a fourth from the past generation to this one. In the middle quintile, it has declined by 5 percent. At the bottom, it's down by 63 percent. "Although we cannot say with any certainty how much mobility today's children will experience over the coming decades," Bhashkar Mazumder, a senior economist at the Federal Reserve Bank in Chicago, wrote last spring, "recent research suggests cause for concern. The gap in children's academic performance between high- and low-income families has widened significantly over the last few decades. " If this trend persists, college will no longer serve as the equalizer for a stratified economy in which the rich get richer and the poor don't. In some ways, the story of middle-class mobility has a silver lining. If you're born into the middle quintile, like the Sherry children were, you've got about a 50 percent chance as an adult of staying there or moving up a quintile, according to Pew. You're just as likely to rise all the way to the top — about 20 percent — as you are to sink one quintile. Education improves your odds of climbing higher: A child born in the middle quintile who finishes college has a three-in-five chance of rising into the top two quintiles. "Economic mobility is not predetermined," says Erin Currier, project manager of Pew's Economic Mobility Project, "but our research has shown that a host of drivers and factors can influence a person's chances of moving up or falling down. " These determinants fall into three categories: social capital (who you know and where you live); financial capital (your savings and access to credit); and human capital (your education). The author is an economics correspondent for National Journal. Still, middle-class mobility in the United States is hardly a thing of the past. Americans born into middle-income brackets remain, as adults, equally likely to climb up or to slide down the income ladder, Sawhill writes. What's the surest way to climb? On that, there's a clear prescription, reflecting a quiet transformation in our notion of how upward mobility works. Nowadays, hard work will get you only so far. If you want to move from poverty into the middle class — or to avoid falling from the middle class into poverty — there's only one route, if you're not Beyoncé or Bill Gates: graduate from college.